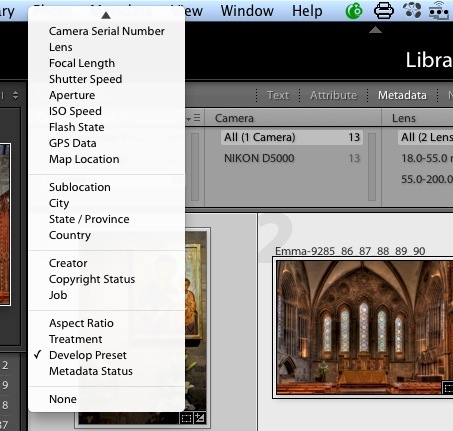 Ever find you have to do some work in Lightroom without adding Picks, selections, stars or other obvious Metadata? I recently found myself tweaking a friend’s images so she could use them immediately rather than wait to get home and work on them at her desktop… She had literally hundreds of photos on the card, but wanted to see them full screen, then wanted a few adjusted, and the issue was, at the end of the exercise, to identify quickly which had been touched to re-export them. With the folder open in the Lightroom Library Module I went to the Filter bar press ‘\‘ if it’s not showing at the top and select ‘Metadata’ then set my selection to ‘Develop Preset’ at this point you may have a few choices particularly if you have used any presets, but everything I had touched was under custom enabling me to quickly pick them out for re-export.